Since 2004, Cascadia’s Emergency Department (ED) Liaison Team has provided support to emergency rooms for individuals who are not eligible for inpatient-level care at the hospital, but who would benefit from additional service connections. Funded by Multnomah County, the ED Team is available 24/7, providing an immediate initial response to anyone admitted to an emergency room in the county. The ED Liaison Team meets with the individual, assesses them for stability in the community, determines if they would like to receive services, and then develops a plan for follow-up and support. The Team makes valuable connections with community partners that they refer individuals to while taking the time to orient people to those services to help them successfully navigate care options. The goal of the ED Liaison Team is to provide outreach and support to those that might otherwise fall through the cracks. It’s not easy to navigate crisis services while you’re in a crisis yourself. Our ED Team Liaisons, part of Project Respond, understand the ins and outs of community systems and work hard to facilitate stability for the people they serve, making the emergency department no longer seem like someone’s only option. “The real benefits of the program are provided in the days following discharge as the ED Team will meet the individual where they are, provide ongoing support services, and link them to immediate and long-term services,” said Barb Snow, Clinical Director of Crisis Services at Cascadia. Emergency room visits related to mental health and substance use are on the rise (the Agency for Healthcare Research and Quality reported a 44% increase in ER visits among this group between 2006 and 2014), and local hospitals are relieved to have access to a resource like the ED Liaison Team. 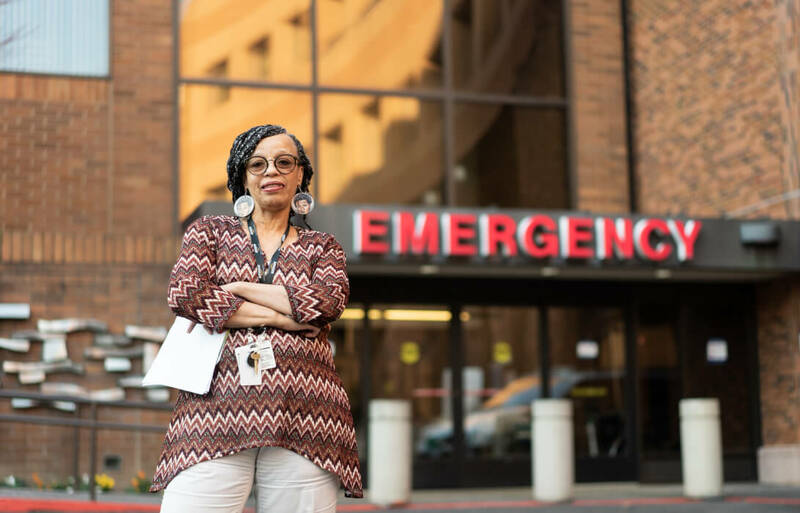 Michelle Farrakhan (pictured above at the Portland Providence ED), a Crisis Counselor and ED Team Liaison from Cascadia, is a great example of the difference an advocate can make for individuals in the emergency room who need mental and/or behavioral health services instead of primary care services offered by the emergency department. Michelle is one of Cascadia’s five ED Team Liaisons. While available for short-term support, the ED Liaison Team is able to accommodate an individual regardless of their situation and connect them to ongoing services and resources to mitigate current and future crisis situations. Over the past year, the ED Liaison Team has served over 700 individuals.